This article describes some uses for rare earth magnets thatare becoming more common in the hobby and toy industry.Specifically this article suggests a few ideas for miniature figure paintingand gaming.Rare earth magnets are available in many sizes and shapes from web retailerssuch as Amazing Magnets.The new neodymium (NdFeB) are much stronger than classic ferrous magnets, and theyare typically chrome plated for durability and good looks. 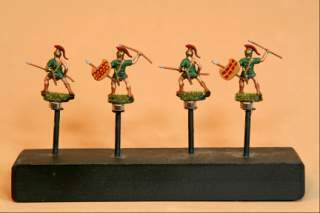 To the right is a photo of some plastic 20 mm miniatures mounted on a paint handle for easy painting.Most painters glue a figure to a large nail or handle so they can be painted without touchingthe painted part of the figure.This handle is an ordinary block of wood with 4 nails so that there is less pick-up and put-downhandling when painting large quantities of figures. Notice the cylindrical disc magnets at the tops of the nail heads. TheseareD125 ~ 1/4" diameter x 1/8" thick NdFeB disc magnet, Ni-Cu-Ni plated(6 mm diameter by 3 mm thick).The magnet bonds together the ferrous nail and the ferrous washer(#10 sae washer, 1/2" diameter, 13 mm diameter) that is epoxied tothe bottom of the plastic figure base.Each magnet has an amazing 2 pounds (9 newtons) of pull on the figureso those figures are very tough to remove. This application has many advantages over my older method of hot gluing figures tothe nail head.For one, there is no glue gun to setup.There also is no sticky glue bond to break at the end of the paint session.The figures are easy to reorder.The magnets are clean and reusable.One slight difference that might be considered an advantage or a disadvantage is thatthe magnets do allow the figures to rotate in place.This is an advantage if you want to reposition a figure slightly to allow betterbrush access, however, it can also be trouble if you are working on the figure andyou never want it to move.This method also requires that you base your miniatures on ferrous bases, which I always dosince it allows you to use magnets for painting, gaming, and storage. 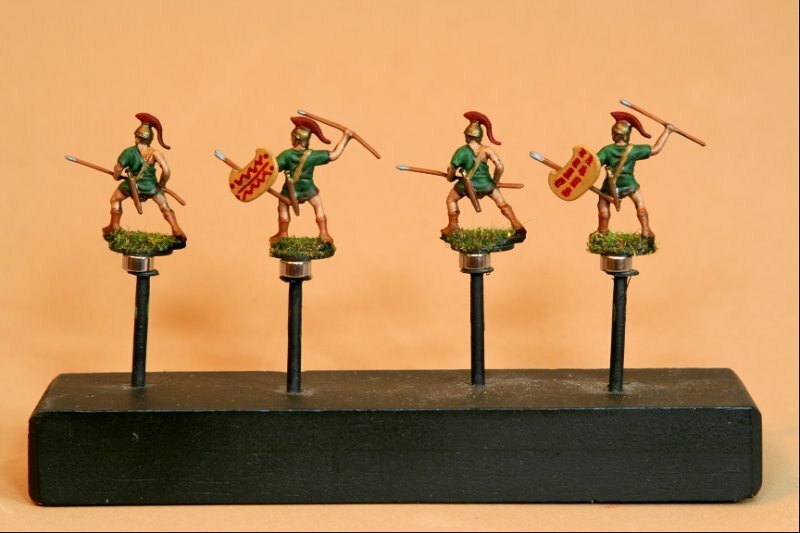 This next application shows how magnets can be used for basing figures into a unit group.The 28 mm miniatures are mounted on a ferrous 3/4" (20 mm) washers.The base is 1/8" thick (3 mm) plywood which is 3 1/8" (80 mm) squarewhich in the miniature gaming hobby is commonly known as a movement tray.An array of 16 holes has been drilled into the base and once again1/4" diameter x 1/8" thick (6 mm diameter by 3 mm thick) NdFeB disc magnetare epoxied flush into the base to hold all the figures nicely in place. Again, each magnet has an incredible 2 pounds (9 newtons) of holding force.Yes, that's right, you can pick up the entire tray of 16 figures by onefigure. You need two hands to remove one of the troops. The entireunit of 16 figures can be suspended by one magnet to a steel ruler.These are figures that will not easily run fromt he battlefield. 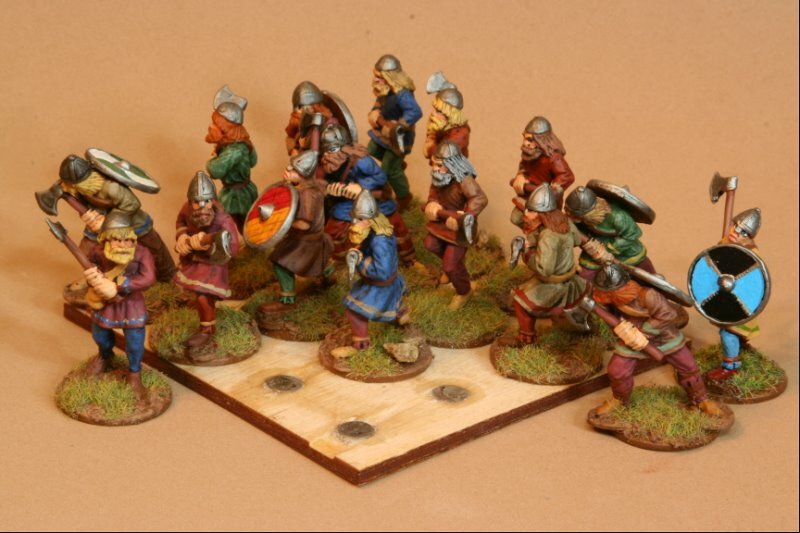 I think for future movement trays, I am going to use smaller magnetswith less holding power.For instance the DO63A 1/8" diameter by 1/16" thick (3 mm by 1.5 mm) disc should be good enough for holding units to a movement tray.However, I am going to texture and flock thistray, and maybe that will cut down the super bond so perhaps a magnet in between these two sizes. I can think of many other uses for these magnets.You can hold a scenery cloth to the table.With tiled game boards or hexes, you can magnetically bond the sections together.You can hold roofs or building sections together to make a take-apart scenery element.With larger figures you can have different weapons attach and break away from the figure.Clearly there are many fun and varied uses for these magnets. Last modified: Thursday, 09-Jun-2011 12:54:59 MST.